Larry Gatlin and the Gatlin Brothers celebrate over 60 years in music today! On this day, 62 years ago, their decades long career started in Abilene, Texas. At that time, Larry was 6, Steve was 4 and Rudy was 2. 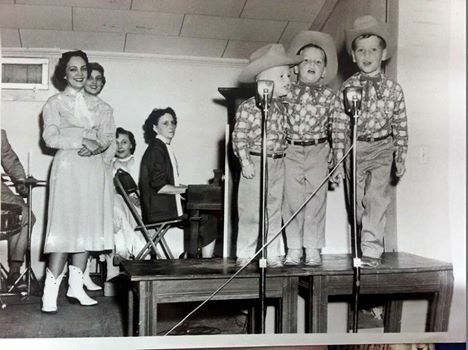 Check out this picture which includes all three, as well as Momma Gatlin on piano! The close family harmonies of Larry Gatlin & the Gatlin Brothers have given the trio a signature sound that led to country classics like “All The Gold In California” and “Houston (Means I’m One Day Closer To You).” The brothers won a GRAMMY® for their 1976 breakthrough hit, “Broken Lady,” and reached #1 with several other songs soon thereafter. Along with five career nominations for the ACM Vocal Group, the Gatlin Brothers picked up three 1979 trophies – Single of the Year (“All The Gold In California”), Album of the Year (Straight Ahead) and Male Vocalist of the Year for Larry Gatlin. Larry Gatlin has written songs that were later recorded by Elvis Presley, Glen Campbell, Barbra Streisand, Johnny Cash, Kris Kristofferson, Charlie Rich, Dottie West and many other artists. For more information on Larry Gatlin and the Gatlin Brothers, visit www.gatlinbrothers.com. They have certainly been very successful! 60 years in music is a long time! It’s not everyday that someone celebrates 60 years in an industry such as music. It’s so awesome that they got this far and that they’re still contributing to music. I’ve heard them before from one of my friend and it’s absolutely amazing. I’m glad that they’re celebrating their music. Wow they’re are amazing and they are still in music industry. I personally don’t know them but it’s really awesome. 60 years in the music business is something to celebrate. I vaguely remember All the Gold in California, and it’s great to see them still performing. Now that’s an awesome milestone! This was a fun read. I hadn’t heard of them! This is huge for them I’m sure!